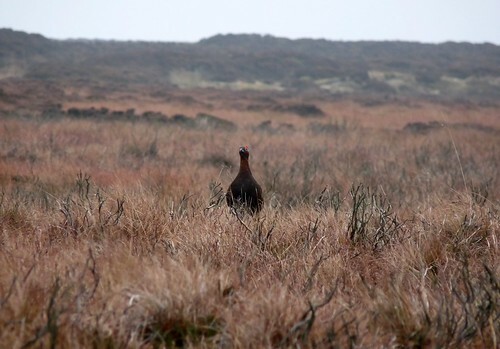 Ilkley Moor is a great place to see Red Grouse. That is what my internet search came back with when looking for somewhere to go walking on the last day of our Leeds trip. 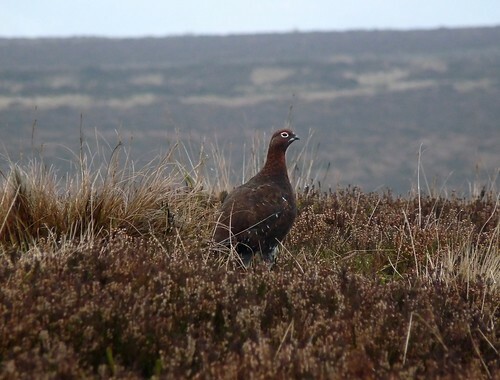 Having never seen Red Grouse (even though I have walked on Ilkley Moor before) it seemed like the ideal place to go and explore once again. Fortunately the fog from the previous day had lifted but it was still very dark with the cloud base barely clearing the top of the hills. We set off from the rock formation known as the Cow and Calf and took in a big loop over the top of the moors including a visit to a rock circle made up of twelve stones (The Apostles). Within a few minutes the unmistakable call of a Red Grouse piped up from the heather in front of us, closely followed by calls from at least two other locations to our side and rear. A dog running around soon had one of the birds in the air as it arced around before disappearing from view once more. I immediately set off in pursuit but the dog beat me to it as the bird was once again flushed. I needn't have worried though as a little further on we came across a female walking along the path in front of us. I snatched a shot but it was way too grainy to be of any use. I knew that I had to try and get a bird against the sky for my camera to be able to produce any results and was fortunate when an opportunity presented itself to allow me to do just that. This male bird was very approachable allowing me to get close enough for the gloom not to be a major issue. I lay down in the bracken partly as camouflage but also to allow me to get the angle that I wanted. 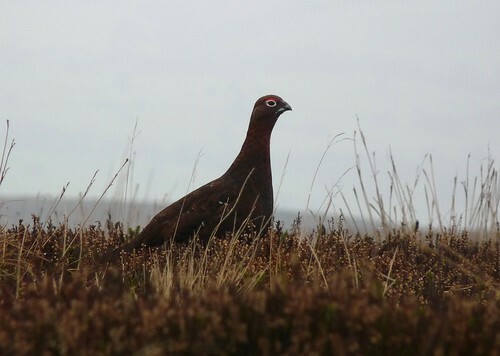 I am very pleased with the results as for a first effort of a Grouse in pretty poor conditions I don't think I could have done any better with the camera I have. Moments after taking the picture the clouds descended even further putting an end to any more photography. It wasn't until I was editing the days photographs that I realised I had a couple of other nice shots that show the birds well in their natural habitat. I am particularly pleased with the first as I feel it captures the atmosphere of the setting very well. It just goes to show that wildlife photography isn't all about the close-ups. Don't forget to include the habitat as that is just as important and spectacular as the subject itself. I should also mention that we saw a single Common Snipe up on top of the moors, as well as a flock of twenty or so Golden Plover flying over. You really never can guess what you will see out there.